Ice Dams can cause significant damage to your home. Here, we present some tips for preventing Ice Dams from occurring in the first place! When a large amount of snow accumulates on a roof, heat loss from insufficient insulation and poor attic ventilation can melt the snow from the underside. 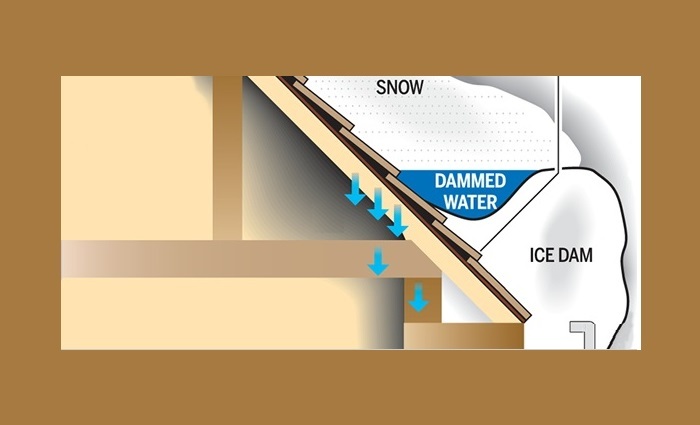 As the water reaches the roof edge, where it's colder, it refreezes and forms a dam, preventing water runoff and rain from reaching your gutters or otherwise getting off of the roof. The dammed water can back up under shingles and roofing materials, and leaks into your home. If you have suffered an Ice Dam, please check out our Tips for what to do when you have an Ice Dam. Ice Dams can be damaging to your roof, gutters, insulation, and drywall. Most times, an ice dam goes undetected until there is significant structural or interior damage. As water comes in through the roof, it can become trapped in wall and ceiling cavities, where it can result in structural damage and even Mold Growth! Often, homeowners don't discover ice dams until they see signs of Water Damage inside their homes, such as water stains, leaks, or mold. Unfortunately, this is usually the tip of the iceberg. Once these affected cavities are opened up, it's common to find far worse damage inside. This is why tearout should only be done by a qualified Mitigation & Restoration Firm that is able to trace this hidden moisture and take appropriate precautions to avoid cross-contamination. Should you have a water issue as a result of an ice dam or other cause, please don't hesitate to Contact Us!